I’m a few weeks behind with this one (amongst others), but I figured it was time to get it up. My Thanksgiving tradition involves a few essential pieces: 1) a different flavored mashed potato every year and 2) everything is organic – all the way down to the olive oil used to make roux. It certainly does not make it a cheap meal, but it’s once a year, so I go for broke ($5/pound for organic brussels sprouts!). After the success of the celery root mashed potatoes a few weeks prior, I knew I’d have to give them a shot in primetime. I added some cilantro to them to give them a nice, fresh flavor – along with some roasted garlic. For the vegetables, I normally make steamed broccoli (which I made, but is not seen here), but I wanted something a bit more. 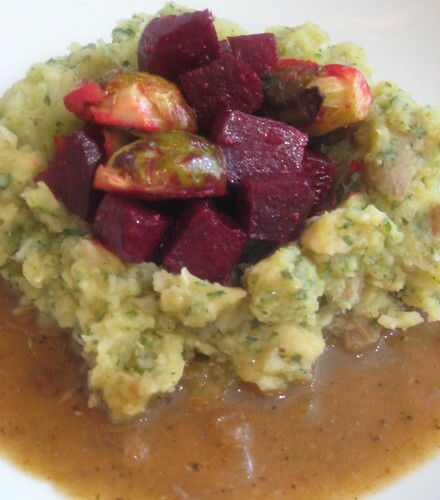 I had what I thought was a great combination – beets and brussels sprouts. I didn’t expect, however, to see that combination on a dozen other blogs. I tossed mine with maple syrup, dijon mustard (homemade), olive oil, salt and pepper and roasted them on 450 until the brussels were crisp on the outer leaves. For the gravy, I sauteed baby portabella mushrooms, removed them from the pan and sauteed green peppers and onions until they stuck to the pan. Deglazed with some balsamic vinegar and added whole wheat flour to make my roux. A little vegetable Better Than Bouillon (the No Chicken wasn’t organic, so I went with the vegetable) with water and a quick puree using the good ol’ immersion blender. I then added my reserved mushrooms back to the gravy and began to season. You can find Poultry Seasoning all over the place this time of year and that’s what I used. And there you have it – Thanksgiving dinner. This entry was posted on December 26, 2009 at 20:18 and is filed under Uncategorized. You can follow any responses to this entry through the RSS 2.0 feed. You can leave a response, or trackback from your own site. Celery root mashed potatoes sound delicious! What a beautiful feast.